Visitors from over 130 countries (and every U.S. state) kayaked in the Hudson River last year via The Downtown Boathouse at NYC's Pier 26. The image above was snapped on City of Water Day in July 2015 by Paul C. Focazio, New York Sea Grant's Web Content Manager, who received a runner-up award in The Waterfront Alliance's #OurWaterfront social media photo contest. Photo: Paul C. Focazio / NYSG. Focazio began taking part in this annual event in 2011, the first three years of which he was a representative for Sea Grant as one of the many organizations in the Waterfront Activity Fair held on NYC's Governors Island. In the last of those years, 2013, he helped bring NYSG's long-standing "Discover Clean and Safe Boating" campaign to the furthest locale from its origin point, which was on the eastern Lake Ontario shores of Oswego, NY. Since 2008, NYSG has educated over 650,000 boaters on how to be environmentally-friendly, safe and legal on the state's waters with its "Discover Clean and Safe Boating" exhibit. The informative panels and maps of our "Great Shipwrecks of NY's 'Great' Lakes" traveling exhibit, which has made over a half-dozen stops in three years, has reaches over 750,000 people total in New York, Pennsylvania and Vermont. More at www.nyseagrant.org/marina, www.nyseagrant.org/shipwreck. 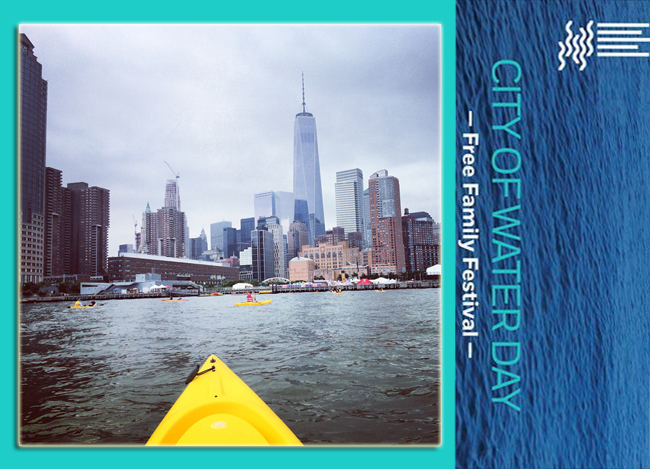 In the last several years, Focazio visited some of the free recreational sites offered to the public in NYC on City of Water Day, including the Manhattan Community Boathouse at Pier 96 (54th St on the West Side) in 2014 and last year at the Downtown Boathouse at Pier 26 in TriBeCa, which is rather close to the Financial District and, as seen in the photo above, the 1 World Trade Tower. 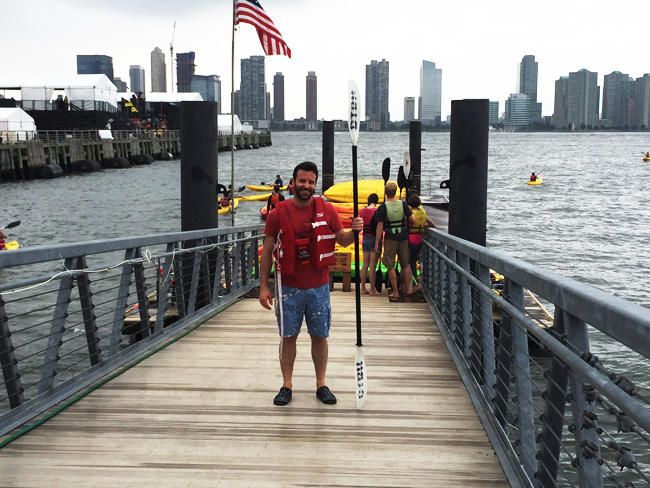 Judging by a flood of reports and media coverage from around the NYC Metro region, tens of thousands of people paddled, ferried, walked, and rode to the waterfront during the Waterfront Alliance’s eighth annual City of Water Day in mid-July 2015. These participants, including NYSG's Paul C. Focazio (pictured above), discovered for themselves the great potential of public access to our many waterways. Photo: Paul C. Focazio / NYSG. New York, New York, July 1, 2016 - The Waterfront Alliance will once again emphasize the importance of public access to New York City and New Jersey's waterways via its City of Water Day celebration on Saturday, July 16, 2016. This free, family-friendly event - which runs from 10 am - 4 pm at at two main locations, NYC's Governors Island and Maxwell Place Park in Hoboken, NJ, as well as dozens of "In Your Neighborhood" locations around the harbor - has grown into the region's largest harbor festival. Over 900 Alliance partners, which include New York Sea Grant, have organized past events and will plan activities for this year's festivities. Highlights of the day include free boat tours on a variety of vessels - from tall ships to tugboats and free rowing, kayaking and paddle-boarding. Most events are free (anything requiring pre-registration or a fee is noted at www.cityofwaterday.org). In 2015, The Waterfront Alliance's City of Water Day was held at 34 locations, at which over some 53 events took place and some 5,000 boat seats were snapped up on more than two dozen free boat tours and ferry rides. This year, "In Your Neighborhood" activities are planned in all five boroughs, Yonkers, and in New Jersey. More than 50 organizations are confirmed to participate, with new groups added every week. "On City of Water Day, you have many terrific opportunities to get on and in the water—all of them free," said Roland Lewis, The Waterfront Alliance's President and CEO. "Take a boat ride and experience the breezes of the wide, open harbor. Explore coves, piers, and dry docks of New York and New Jersey that you never knew existed. Jump in a kayak and splash around. Reach into a tank and touch a crab. There are all kinds of free recreational and educational events throughout the metropolitan region on this day." The festival’s In Your Neighborhood activities are organized by some of our more than 900 Alliance Partners. From free kayaking to rowing to hands-on workshops, In Your Neighborhood events offer something closer to home for people of all ages. Most of these events are free (anything requiring pre-registration or a fee is noted). In 2015, The Alliance offered 53 events at 34 locations. For regular updates, including announcements about boat tours and other festival information, see The Waterfront Alliance's Web site, and follow them social media via the hashtags #CityofWaterDay and #OurWaterfront on Twitter and Facebook. City of Water Day—including boat tours—is held rain or shine! On-water activities will be postponed or suspended only in the case of thunder and lightning. 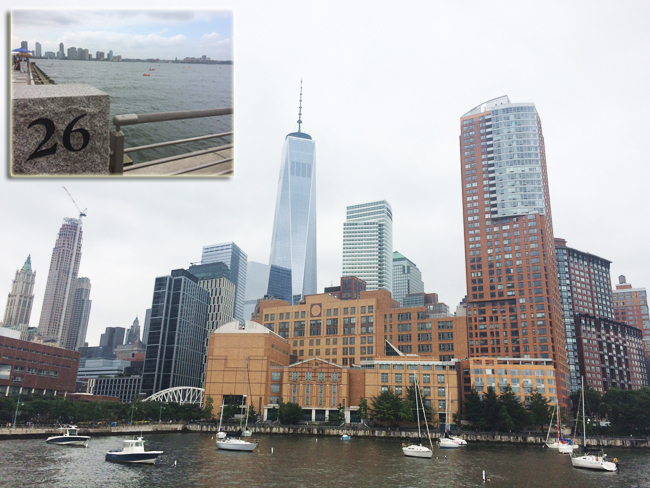 Each tack on this global map marks where a spot from which visitors have come from to kayak at New York City's Downtown Boathouse within the last year. 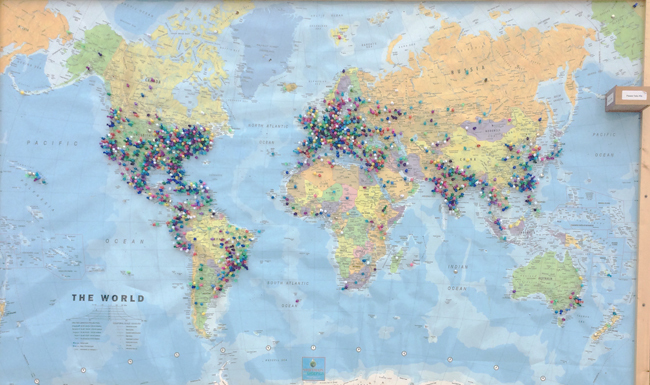 So, according to the image, taken in mid-July 2015, visitors from more than 130 countries (and every U.S. state) took part in this free on-the-water activity. Kayaking is generally offered, weather and water conditions permitting, most weekday evenings from mid-June through mid-September and on weekend days from mid-May through mid-October. For more, visit www.downtownboathouse.org. Photo: Paul C. Focazio / NYSG. View of One World Trade Tower from The Downtown Boathouse at Pier 26 in TriBeCa. Photo: Paul C. Focazio / NYSG. Kayakers gathered at Governors Island on City of Water Day in mid-July 2015. Photo: Bernard Ente.